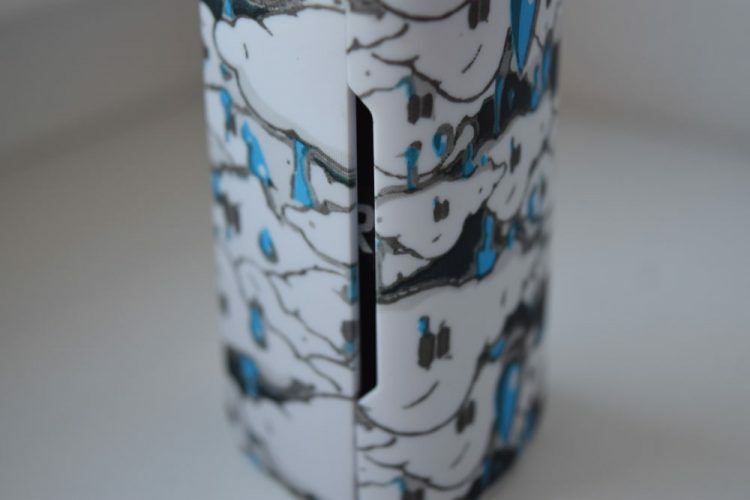 Get a great price on the Rincoe Manto S 228W vape mod from Element Vape. Finding a dual-battery advanced vape mod with high power output and multiple modes for under $30 is pretty tough, but Rincoe’s new Manto S mod proves that it’s definitely not impossible. With a max power output of 228W, temperature control and bypass mode, the Manto S is no joke, and whist not as feature-rich as most of its competitors, it’s a solid choice for vapers who value simplicity and affordability over bells and whistles. 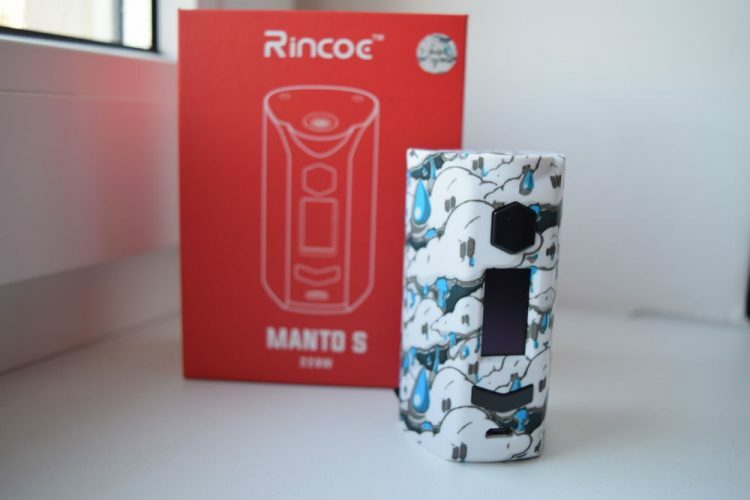 The Rincoe Manto S 228W mod comes in a red cardboard box with a picture of the device on the front, and a list of contents, some warnings and company information, on the back. Inside the box, we have only the Manto S mod and a micro-USB cable for charging. It sounds austere, but this is pretty much the standard mod kit. However, if you’re looking for an all-in-one solution, you can also find the Manto S as an advanced kit, paired with the Rincoe Metis subohm tank. The Manto S vape mod measures 70mm x 40mm x 37mm and has a design reminiscent of the original Smoant Battlestar 200W or the old Wismec 2/3. 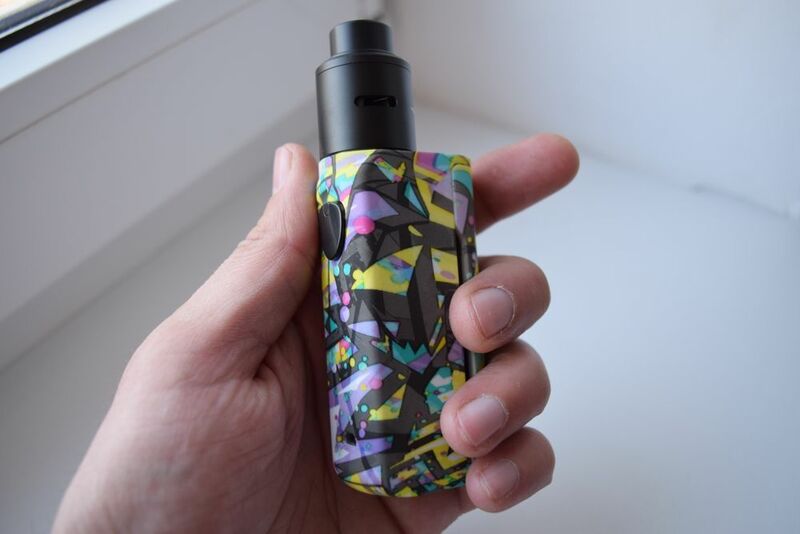 It’s what I call a “fat” vape mod, but thanks to rounded edges, a rubberized finish and a lightweight body, this device feels very nice in the hand. 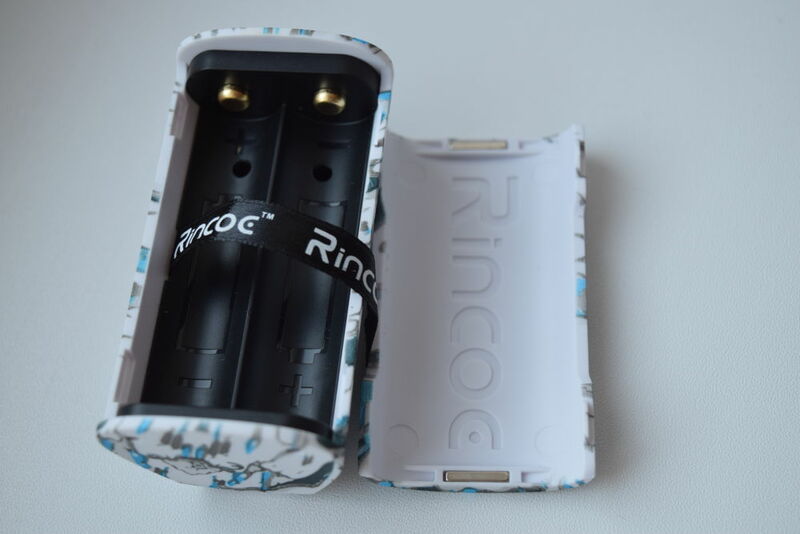 As I wrote in the introduction, finding a dual-battery vape mod for under $30 is not easy, but Rincoe managed to bring down the price point considerably by opting for a cheaper material. 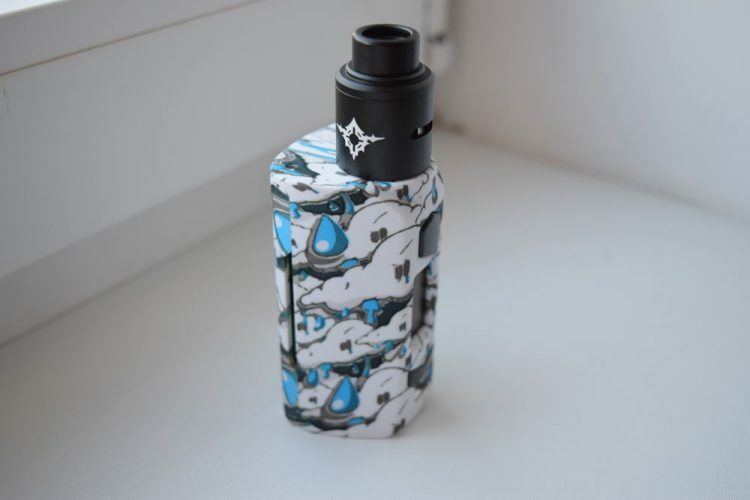 While most mods nowadays are made of zinc or aluminium alloys, the Manto S is made of polycarbonate (PC), a plastic-like material that’s not only incredibly light but very durable as well. I haven’t actually tested its durability, but the company claims that it gives the mod “anti-shock” properties, so I guess it’s pretty tough. The thing about PC is that it’s super light, so light in fact that the mod almost feels cheap, especially without any batteries inside. For some people, that may be a con, while others will surely appreciate how light the device feels compared to other dual-battery vape mods. If the polycarbonate body of the Manto S is a problem, you can always opt for the Manto X, which features the same chip in a zinc alloy body. It’s about $10 more expensive, though. At the top, the Rincoe Manto S 228W mod features a 510 connection with a gold-plated, spring-loaded pin, and a small plate that prevents you from scratching the mod by screwing on an atomizer too tight. However, the plate is raised only so slightly, so you don’t get an unaesthetic gap, like on the VooPoo Drag 2. 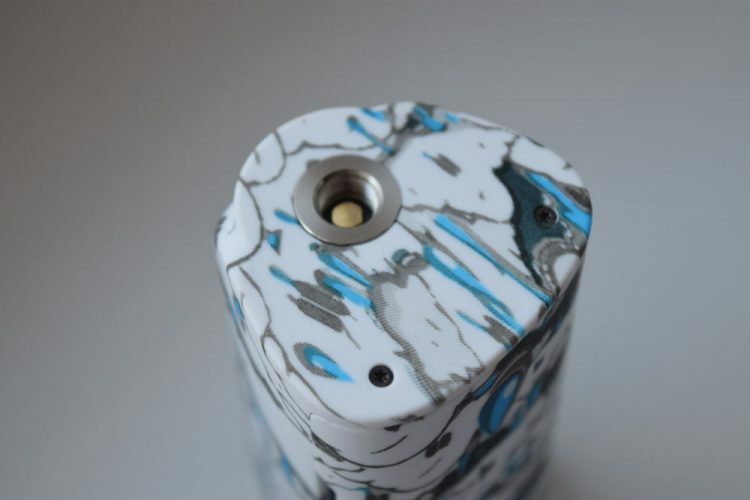 The connection isn’t centered, but you can use the Manto S with atomizers up to 25mm in diameter without any overhang. Other that the venting hole size, the battery compartment is pretty clean, the battery trays feature clear polarity indicators, the contacts at the top are spring-loaded, and since the mod is made out of polycarbonate, the chances of a short-circuit are very low. The sample I received for this review features an artistic paint job called “Acid Rain”, but you can choose from a dozen other designs, some eclectic, some classic, but all visually appealing. The Rincoe Manto S is all about simplicity and its menu system is a clear proof of that. There are no submenus to get lost in, as all the tweaking is done on the home screen, and the few button combinations are simple and easy to remember. Whatever mode you are in, adjusting the power is done via the ‘+’ and ‘-‘ buttons. To switch modes, all you have to do is press the fire button three times in rapid succession. You’ll see the ‘mode’ icon at the top of the screen, next to the battery indicators, start to blink, and you can use the ‘+’ and ‘-‘ buttons to cycle through the different modes. 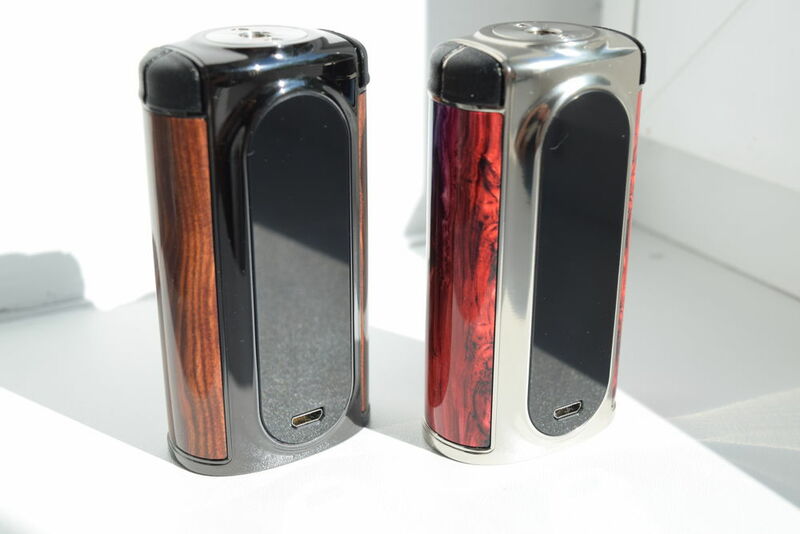 There’s wattage mode, temperature control (nickel, titanium, stainless steel), TCR and bypass, which draws voltage straight from the two 18650 batteries, like a mechanical mod, but with protections. Pressing the fire button and the ‘-‘ button at the same time for a couple of seconds while in temp. control or TCR will let you adjust the wattage, and keeping the ‘+’ and ‘-‘ buttons pressed lets you lock and unlock the adjustment buttons while keeping the fire buttons active. That’s pretty much all there is to the menu and navigation. There’s no pre-heat option, no custom curves mode or screen customization, so if you’re looking for that kind of features, you’ll probably be a bit disappointed. The Manto S isn’t firmware upgradable either, so this is as advanced as it’s ever going to get. The Rincoe Manto S is powered by two 18650 batteries (not included in the kit). Battery life will vary on the capacity of the battery, the power output you set on the mod, and how much you vape. I’ve been using it with two LG HG2 3,000 mAh batteries, at around 60W, and getting about 8-9 hours of vaping time out of it, which is not too shabby. The Manto also features vape-while-charging technology, so you can also use it while it’s charging. Surprisingly, it even has fast charging (2A), so it will get your batteries back to full in no time. Still, as always, I recommend using an external charger and only charge the batteries inside the mod as a last resort. Performance-wise I can only comment on how it works in wattage mode, because I’m not really a fan of temperature control – nothing wrong with it, I just don’t enjoy it that much – and don’t really need the raw power of bypass mode either. I like that the Manto S has all these different modes, but only one I care about is wattage mode. I’ve been using the Rincoe Manto S for nearly two weeks now, and I’ve had absolutely no issues with it. 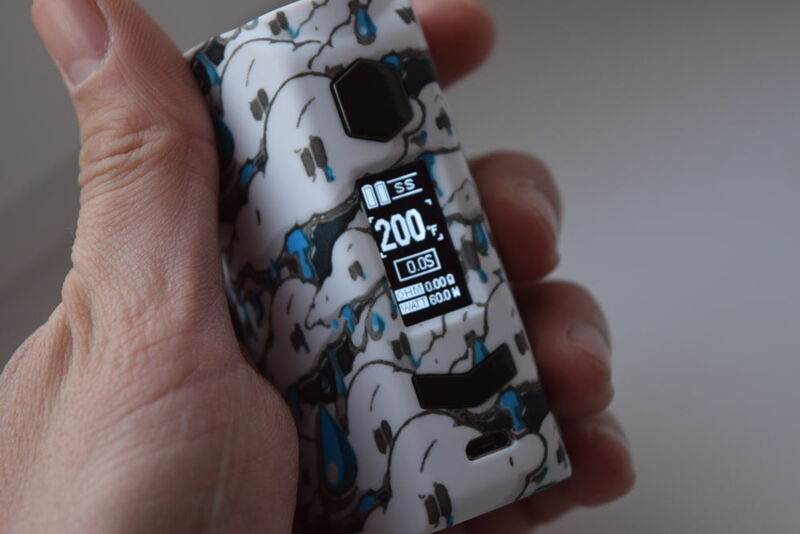 The buttons are nice and clicky, the mod fires extremely fast – like most mods nowadays, to be honest – and the power ramp-up, while not as impressive as on a pre-heat device, is on the fast side as well. I don’t have the tools or the technical knowledge to test the accuracy of the power output, but just using my experience as a vaper, I’d say the power is very close to the value displayed on screen. Does it really hit 228W? I honestly have no idea, and I don’t really care? Who vapes at over 200W anyway? 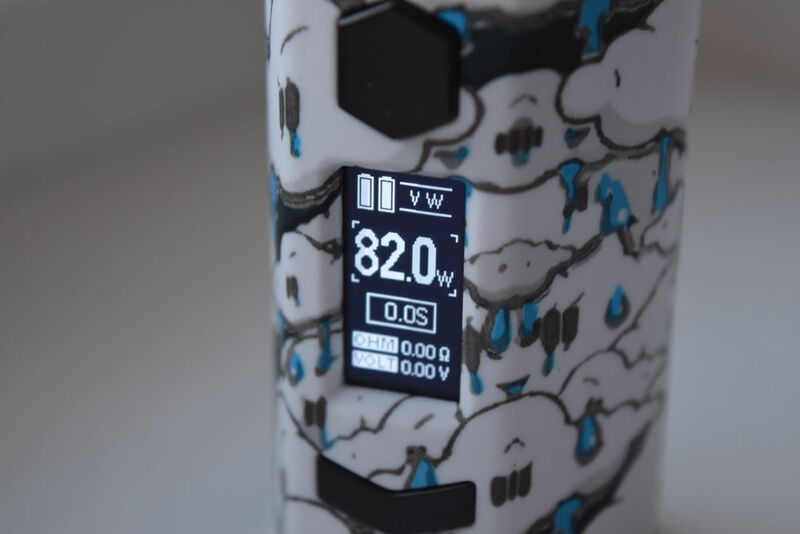 It does fire with resistances down to 0.05Ω, so I guess it may in fact do close to 228W, but unless you’re competing in a cloudchasing competition, I wouldn’t recommend vaping at that level. The Rincoe Manto S isn’t the most advanced dual-battery mod money can buy. In fact, it’s actually pretty basic, but in a good way. You get power mode, temperature control and bypass mode, an impressive power output and a user-friendly menu at an incredible price. So if you’re trying to save money and don’t really care about customization, pre-heat settings or bells-and-whistles in general, it’s a fine choice. The Rincoe Manto S was sent to me directly by Rincoe, for the purpose of this review.